Buddhist philosophy and Sunyata - the emptiness of all things. And the sentient mind is NOT a physical construct or epiphenomenon of matter. The mind is clear and formless and has the power to know phenomena in a qualitative way [KELSANG GYATSO 1992], and hence give meaning to them. Buddhists regard the persistent delusion of 'inherent existence' as a major obstacle to spiritual development, and the root of many other damaging delusions. One of these delusions is the materialist belief in an objective reality existing independently of mind. By asserting that the universe exists inherently as a brute fact, materialism denies that subjective experience has any relevance to or influence on the universe, or indeed any existence at all. Does it temporarily cease to be a car when it's in for repairs and the transmission is several yards away from the rest of the vehicle? Is my car still a car when I wake up one morning to find it supported on bricks with the wheels missing? Or, could I say that the essential feature of a car is that it performs the functions of a car? So does it cease to be a car when it won't start? And does it return to the state of being a car when I cure the problem by spraying the electrics with moisture repellent? Does the true 'essence' of a car therefore reside in an aerosol can? From a long term evolutionary perspective, there is (or was) a continuum of form between all living things. If we were to examine the fossil records of the ancestors of cherry trees and plum trees we would find that they diverged from one common ancestor. Looking back through the fossils we would seen a continuous gradation of characteristics from the ancestors of the cherry to to the ancestors of the plum, leading back to a time when they were indistinguishable. But the decision as to where ancestor ended and plum or cherry began would be totally arbitrary. And if we were to trace the common ancestor of the cherry and plum we would find convergence with the ancestors of the rose, strawberry, raspberry etc. What Darwin did for creationism he also did for biological Platonism - the biological species concept does not encapsulate any underlying truth [BROOKES 1999], and each individual species is unfindable. The 'species' being a snapshot of a population at a particular time in its evolution. 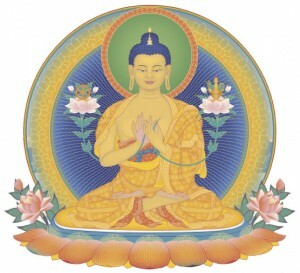 The ultimate unfindability of the real nature of all phenomena - their lack inherent existence, is usually referred to by English-speaking Buddhists as 'emptiness', which is a translation of the Sanskrit word Sunyata (sometimes spelled Shunyata). According to David Loy the English word emptiness has a more nihilistic connotation than the original Sanskrit. The Sanskrit root su also conveys the concept of being swollen with possibility [LOY 1996]. It is therefore most important not to confuse emptiness with total nothingness. Emptiness implies the potential for existence and change. The mathematical analogy of emptiness is not zero, but the empty set. (1) Gross dependent relationship - causality. (2) Subtle dependent relationship - structure and spatial interrelationships. Existence in dependence on structure is more subjective. We may view a car as composed of a chassis, an engine and four wheels. Or we may take a more detailed view with the engine being seen as pistons, cylinder-head, carburettor etc. These too can be analysed into subcomponents, all the way down through atoms of iron and carbon, to the fundamental particles such as protons, electrons and the photons which shine from the headlamps. Our perception of dependence upon structure is very much determined by how we choose to subdivide the whole. The mind has to participate by applying analytical effort to generate the view of existence in dependence upon parts and assemblies. A spark-plug is only a spark plug because we know what it does and where it fits. If you were to show a spark plug to Isaac Newton, he would not be able to give it a meaningful name. It's when we get to the final stage of perception of dependence in terms of the fundamental building blocks of matter that we come up against the very subtle (most participatory) level of dependent relationship of imputation by mind. Experiments in quantum physics seem to demonstrate the need for the participation of an observer to make potentialities become real. The mathematical equations of quantum physics do not describe actual existence - they describe potential for existence. Working out the equations of quantum mechanics for a system composed of fundamental particles produces a range of potential locations, values and attributes of the particles which evolve and change with time. But for any system only one of these potential states can become real, and - this is the revolutionary finding of quantum physics - what forces the range of the potentials to assume one value is the act of observation. Matter and energy are not in themselves phenomena, and do not become phenomena until they interact with the mind. These experimental aspects of sunyata are described in quantum phenomena. The question that separates the Materialist from the Buddhist is whether there is anything left to explain about reality once algorithms and and datastructures have been factored out. (ii) The mind produces quantum weirdness. [KELSANG GYATSO 1992] The First Panchen Lama, cited by Geshe Kelsang Gyatso in Clear Light of Bliss, 2nd Edition page 146 (London:Tharpa Publications, 1992, ISBN 0 948006 21 8).